An effective on-site search implementation provides unique insight into your visitors. By observing what visitors are searching for you can make educated decisions about areas of improvement when it comes to your content. SearchWP’s Metrics extension collects comprehensive data for on-site search, and provides you with actionable advice about refinements you can make to your content as time goes on. Metrics was built to be a turnkey Extension for SearchWP. Metrics is a standalone WordPress plugin that should be installed and activated alongside SearchWP itself. Once installed and activated Metrics will immediately begin tracking searches and clicks. Metrics will begin displaying data as soon as enough has been collected. 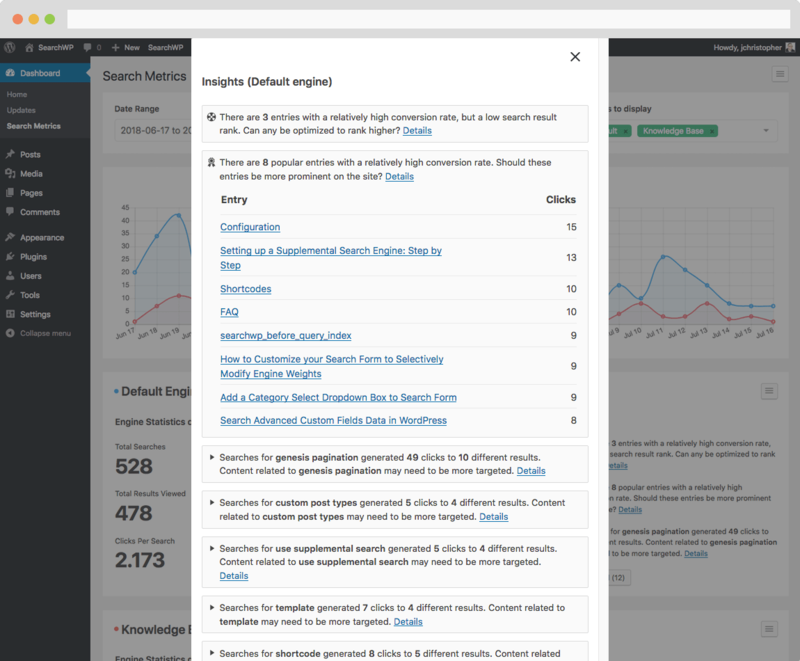 Metrics was designed to supersede SearchWP’s core statistics feature. 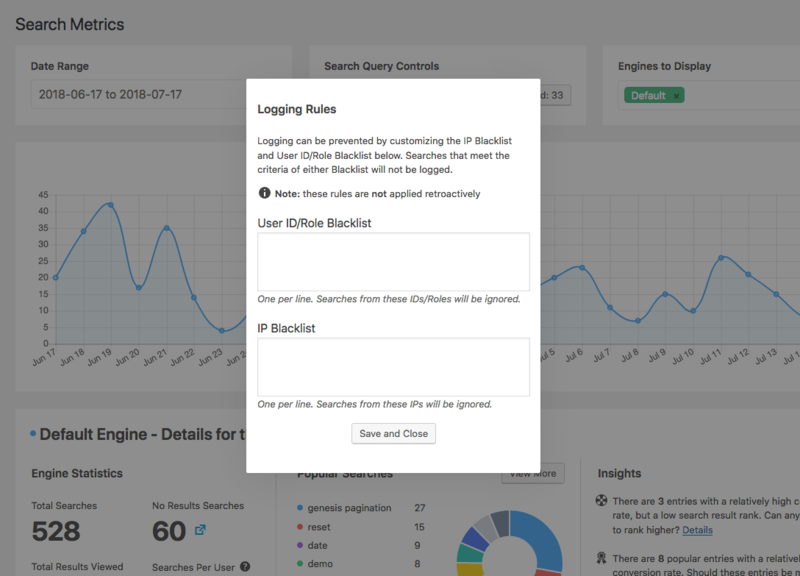 As a result, both the SearchWP Statistics page and Dashboard Widget will no longer display, and counterparts from Metrics will take their place. By default, Metrics will automatically track clicks for the Default engine, assuming that your search results template uses The Loop. Any link within The Loop that is generated using get_permalink() (or variant thereof) will automatically be set up for click tracking. If you’re using a standard search results template you should be all set without needing to make any edits. To integrate click tracking in your supplemental engine(s) you need to add two Hooks to your results template, one before your own loop of results, and one afterward. All links generated with get_permalink() (or variant thereof) within those two actions will be processed by the click tracking within Metrics. 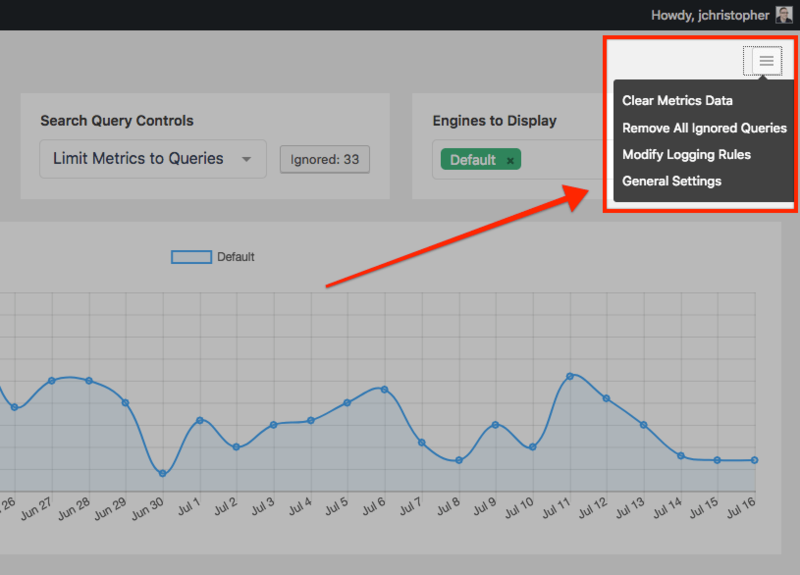 Metrics ships with its own Dashboard Widget that allows you to take a quick look at basic data when you log in to your site. 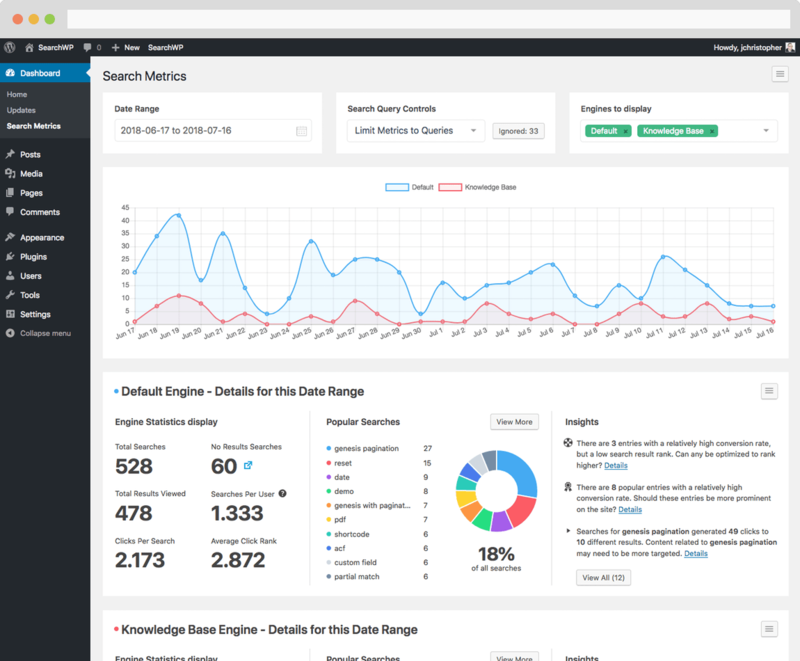 The Widget updates in real time as you visit your Dashboard, and you can customize the number of popular searches and number of popular posts shown. Date Range: Customize the date range shown in the main chart and engine details. Search Query Controls: Limit the data displayed to a set of search queries. 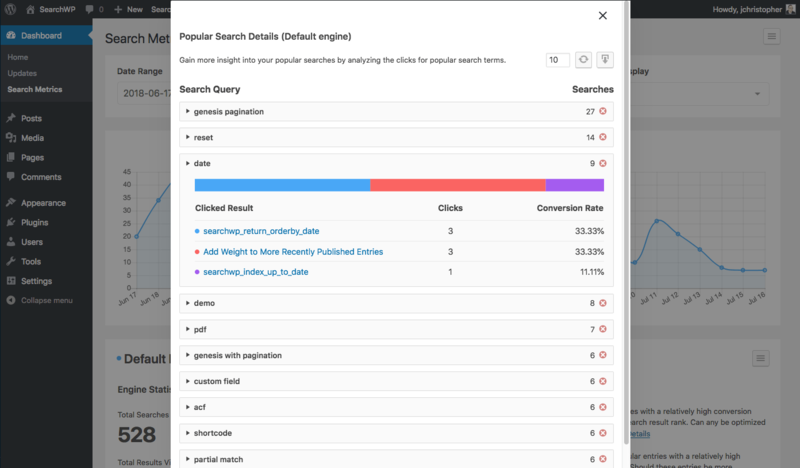 You can also control what queries have been ignored. A details area is shown for each selected engine. When clicking the icon next to the No Results Searches you’re able to review a list of all of the search queries that yielded zero results, and how many searches there were. This list can be reviewed for accuracy as time goes on. Clicking the × icon next to a failed search query will add it to the list of ignored searches. For each listed popular search you can expand additional details including which entries were clicked as a result of that search query and how many times. 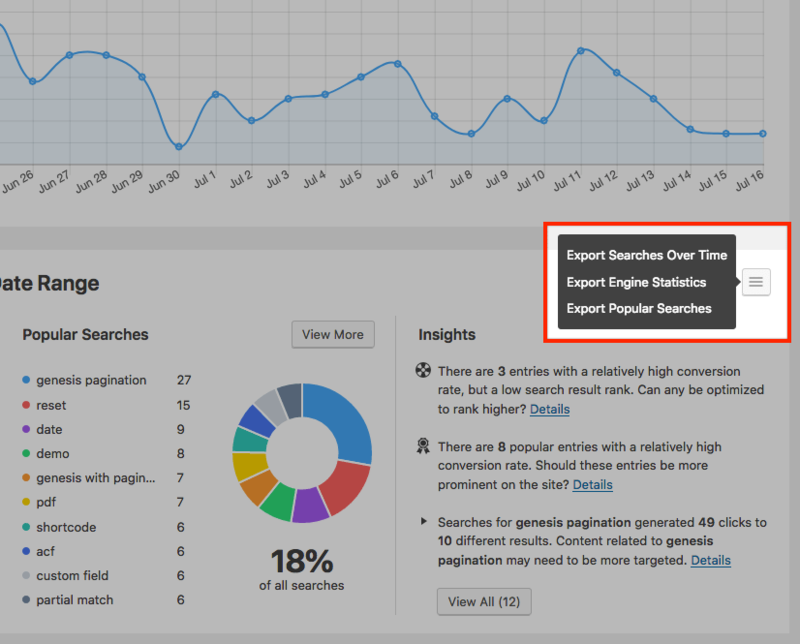 Using the controls at the top you can control how many popular searches are returned, and also export the data to CSV. Content is ranking low but getting a lot of clicks: can this content be optimized to rank higher? Content is getting a high conversion rate: should this content be more prominently linked because so many visitors are searching for it? Searches are converting on a variety of posts: should new content be created for these search queries? Exports are formatted as CSV files, which can then be used in any way you’d like. Metrics integrates some shortcuts and settings that can help you customize things a bit. You can use Clear Metrics Data to remove the data logged by Metrics, and Remove All Ignored Queries will reset your ignored queries leaving nothing ignored. These operations cannot be undone so make sure you have a backup if necessary! Here you can add any combination of WordPress User IDs or Roles that should have their searches ignored. You can also maintain a list of IPs to blacklist as well. This makes excluding internal searches (so as to avoid polluting data) a bit easier. Metrics is able to use its tracking data to provide a buoy of sorts for search results. 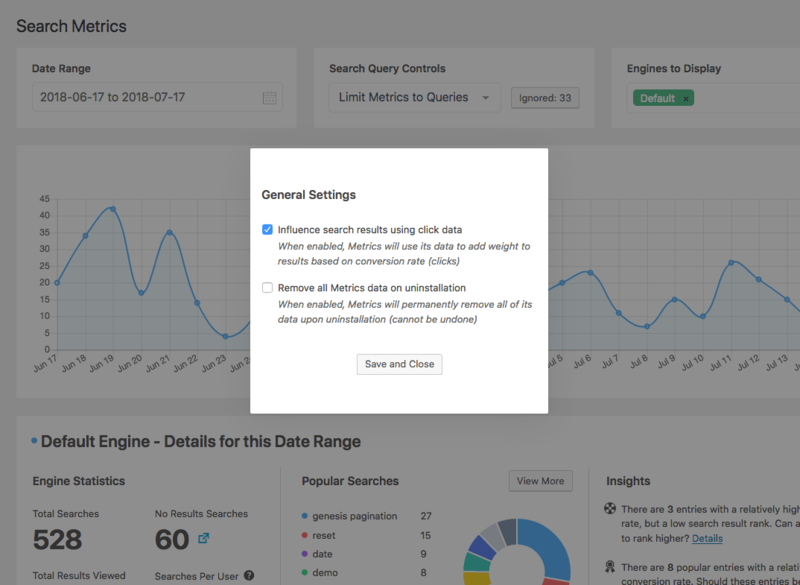 If you’d like results with more clicks to rank higher over time than those with fewer clicks, you can tick the checkbox to Influence search results using click data. This feature requires SearchWP version 2.9.14 or higher. Metrics can also clean up after itself. With the Remove all Metrics data on uninstallation checkbox ticked, Metrics will remove its custom database tables, all click tracking data, and any stored options upon deletion.